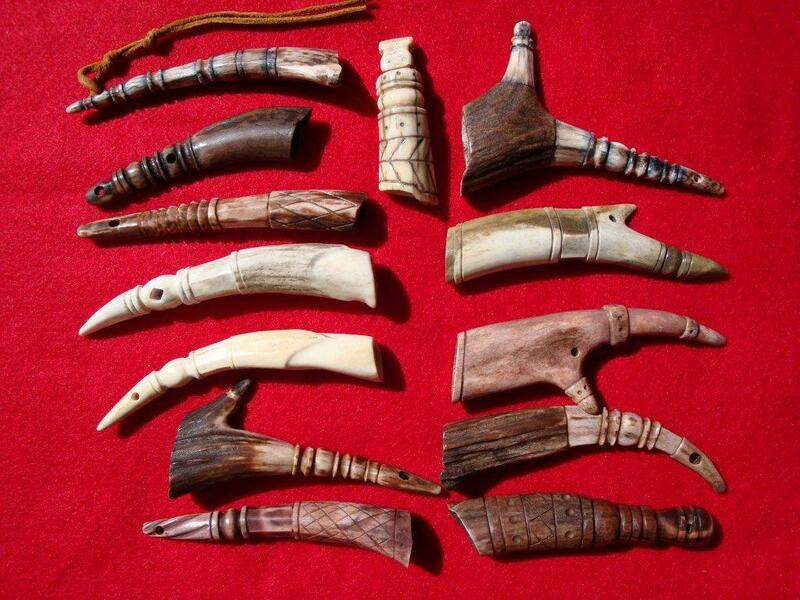 Antler, Bone or Horn? 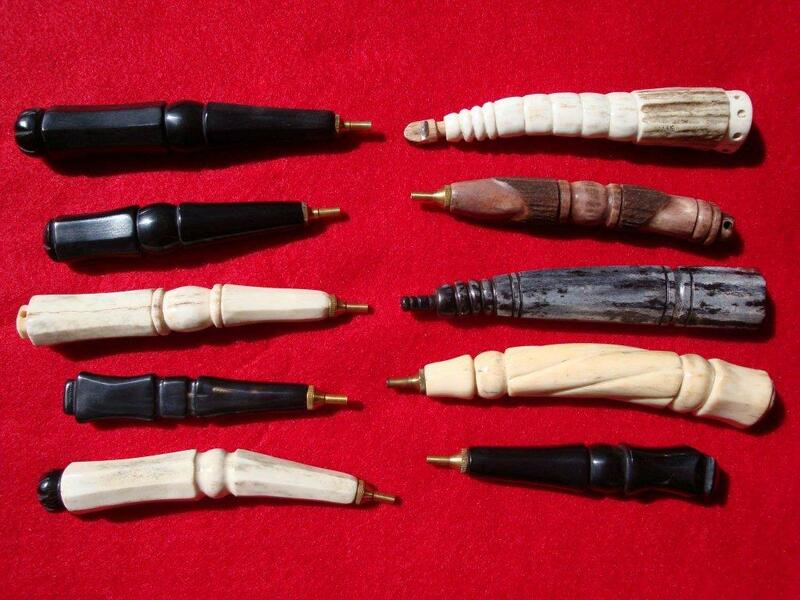 Choose from a selection of fine quality primers available from Eddy Benc. See our Trading Post Advert. Hello! Once again we do the rounds of our traps and welcome all members and readers; with a special welcome to our newest members Eddy Benc and Peter Convey. Both are no strangers to black powder. Peter, from the Western Districts, featured in our May 2008 newsletter while Eddy hails from South Australia and is remembered by those who rendezvous’d at Pine Ridge with Glen Mitchell some 30 years ago. We also had the pleasure of Eddy and partner Elsa’s company at our 2011 New Year barbecue. Eddy comes ready to trade so check out the little gems pictured above – now don’t drool on your laptop! April was a busy month for your committee. Following constitutional lines we did some position trading within ranks. Giving an overworked Murray a break from the Treasury we imposed on Bob to take over that role, moved Jim into Vice President with Murray occupying Jim’s former slot as Ordinary Committee member. We hope Murray feels more special than ordinary though, and thank him for his job well done. 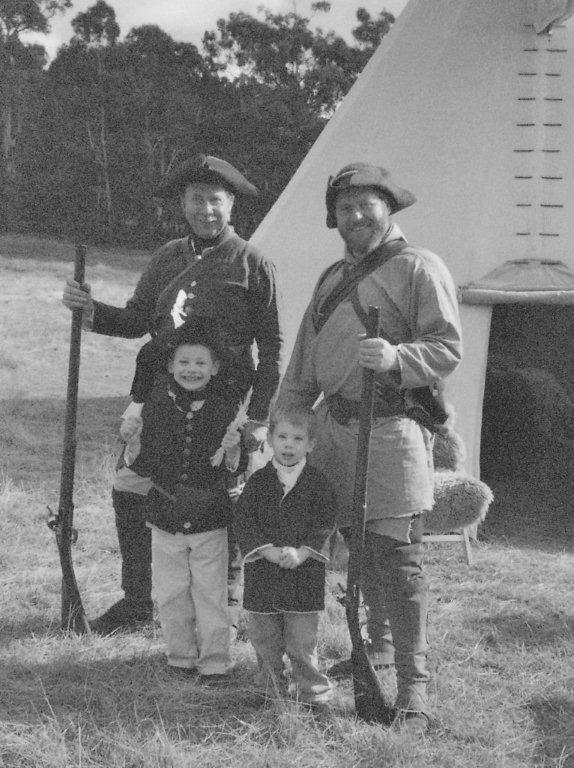 In the several weeks leading up to our Easter rendezvous we were suddenly made aware of governmental proposals to amend the regulations governing the storage and transportation of Black Powder. This resulted in frantic efforts to get you all to sign petitions to WorkSafe to protect our supplies and suppliers from these completely unworkable proposed new regulations becoming law. Many thanks to all those who forwarded the prepared submissions or who wrote or emailed their own submission. Peter and Murray Convey set up camp at Caveat. Skins & chairs for trade! The 22nd Eureka Arms and Militaria Fair at Ballarat. 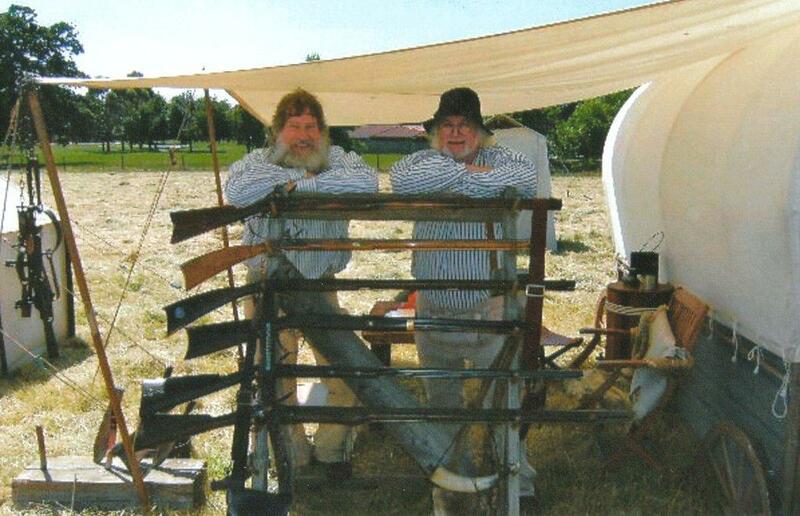 Saturday one day only from 9am until 3.30pm the Council of Muzzleloaders representing the Free Trappers, Seymour Black Powder Club and Western Districts Muzzleloaders will attend a promotional display table. Adult entry $7, free if you wear complete Trapper/Longhunter outfit. Leap into the future at Beechworth’s Ned Kelly Festival. Shuck off those pre-1840 duds and embrace time travel into the 1870’s and 80’s. Join all the fun at historic Beechworth and camp over on the Police paddocks right behind the Courthouse where the wounded Ned will re-hear the charges against him. Streets of period style tents planned. Be in the thick of the weekend’s re-enactment festivities and country fair. Contact Bob Ellis for further details. Our traditional Spring Rendezvous weekend extended from Friday 16th through to Monday 19th. Arrive early to be assured of a place in the Mountain Man hunt. – Where? – Why, Beaver Creek at Whorouly, of course! Time Line Festival at the Old Cheese Factory, Berwick. A weekend display camp in the heart of Melbourne’s eastern suburbia. Your chance to show the Flatlanders what Mountain Man fun is all about. Paul and Jeff ready Nathaniel & Nicholas for a long hunt. Autumn and the Easter holiday weekend is a fabulous time of the year. There is always so much happening and so many choices of things to do. But our smaller dedicated group of black powder burners had only one thought; that was to rendezvous around the nearly completed burnt-pine shelter at Bernard’s Cache. Built from pine flitches salvaged from the 2009 bushfires, the shelter needed only some gap stopping where the summer sun had shrunk the timber and cold winds might now whistle through to chill the bones in winter. What better time to complete this task than the lovely warm sunny days of autumn? Once again Jim was first to arrive and pitch camp, followed this time by Bob and Lyne getting there early to erect the big 22 foot tipi. 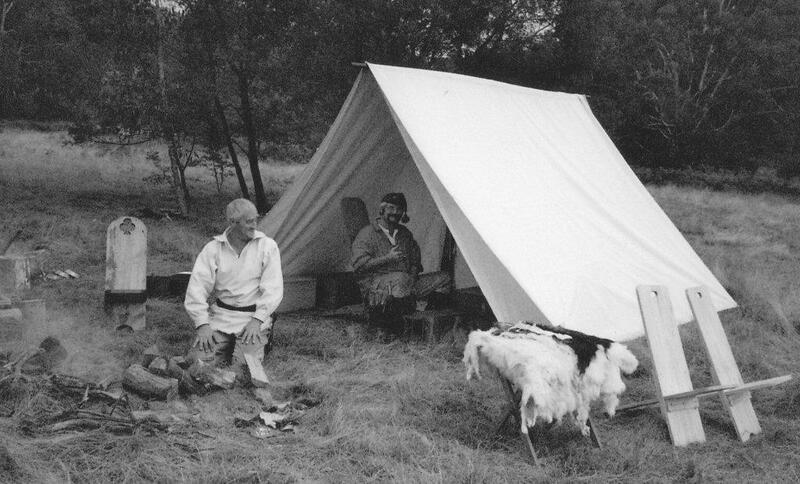 When the Chookster arrived late Thursday afternoon the elements displayed threats of rain despite the fine weather forecasts, so it was up with the wall tent smartly in the darkening skies. You can bet Jim had the main campfire burning brightly, the dark clouds blew away, a whisky bottle broke out and a wine bottle was passed around. Good Friday dawned cool, clear and bright and the grass, much longer than at previous visits, was very wet with heavy dew. Morning coffee at our shelter never tasted better. After breakfasting it was time to get on with chores. Bob and Lyne were hard at work stopping up the cracks in the shelter. Bob was measuring each plinth and doing the fastening, while Lyne did all the cutting and sawing. Thanks to Bob and Lyne we now have a fine draught free shelter. Meanwhile Jim was cutting into a stand of dry dead timber, knocking up a vast pile of firewood. 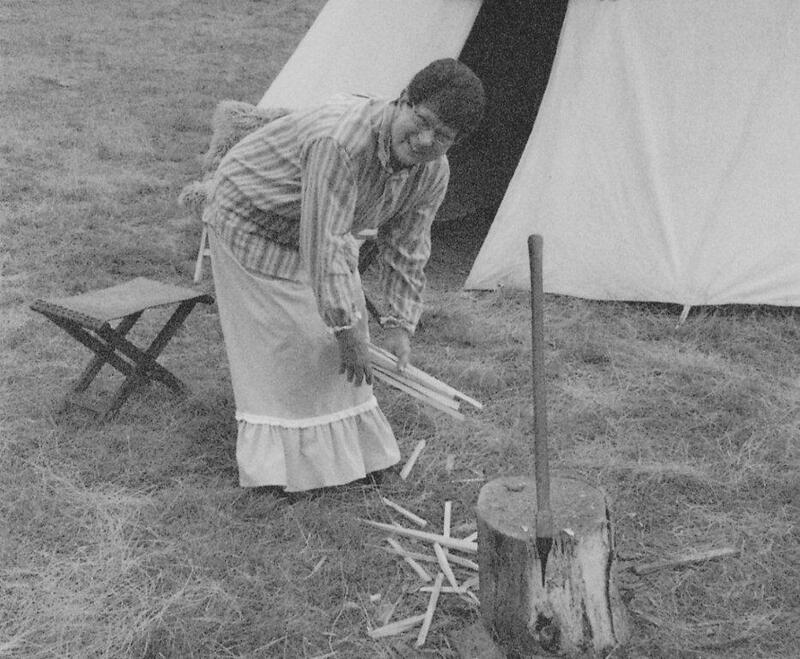 When hauled into camp, Lyne also showed deft wood splitting skills with Bob’s straight hickory handled period style axe. But where were the Convey brothers – Murray and Peter? We had expected them to at least help with the chores. Peter would be attending his first camp with us and is now our newest member. Seems Murray assumed directions and took a wrong turn leading them quite a ways from the main trail. No, I wouldn’t suggest Murray was ever lost – but he did admit to being fearsome confused for a while there. Well the brothers eventually cut sign, found the right path and made it to camp. Jeff also made his first visit to Bernard’s Cache and instantly fell in love with the place. Paul with his two lads, Nathaniel and Nicholas, arrived on Saturday for the day only. Both youngsters were impressively dressed in period costumes hand sewn by Paul and it was obvious throughout the day they were enjoying a marvellous time, as boys do. Trialling the evening fire from under the shelter those first nights indicated a need to draw the hearth closer in, so the next morning was spent locating and hauling suitable large rocks. Peter’s stonemasonry skills came to the fore and with help all around we soon had a new fireplace reflecting lovely warmth into the very depths of our shelter. It still being duck season, Bob and Jim decided to take the smooth bore flinters for a walk to check out the farm dams. The wily ducks saw them coming and took off for the next waterhole. Bob and Jim persevered and at the next dam they each got off a shot – at the same time – at the same duck! Shades of Jeff and Paul’s story last edition. 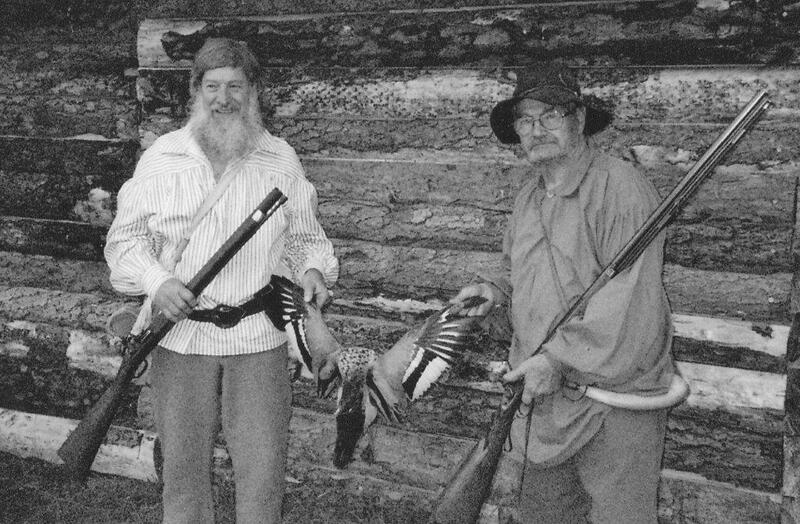 Bob & Jim display the wing patterns of their Wood Duck. Jim gutted and plucked that Wood Duck and slow roasted it in the Dutch oven with some apple and onion. Bob said it was the best wild duck he had ever tasted. I said it was the best wild duck I had ever tasted; as providence would have, I managed to score a goodly portion. Thanks Jim – (Eat your heart out, Janine). The scent of plucked wild duck lingering in the air drew the attention of a fox well after dark. Peter & Murray were awoken when the red dog rattled some pots while searching to steal a meal. Long gone are days when a loaded gun was kept handy for such occurrence, so Peter articulated two words that it should depart our camp hastily. Next day, Jeff set up an interesting little challenge shoot using some rabbit head cut-outs as make believe Hostiles. In modern terms it might have been called a “3 position shoot”, but with one foot in contact with a position marker. Basically, that meant a standing shot, a kneeling shot and a difficult lying-on-your-back shot taken over a log. Two of the “Hostiles” were at 25 yards, one at 50 and one at 55 yards. We formed up in three teams of two for this timed event. Murray and Peter were first up while the rest of us watched and gave advice on how it should be done. Chook and Jim were next and promptly forgot their previous good counsel. Last up were Bob and Jeff who heeded no advice, routed the hostiles and galloped home to win in the shortest time. Results: Bob & Jeff – 5 minutes; Murray & Peter – 9 mins 20 sec; Jim & Chook – a full 15 minutes. Now this little exercise simply illustrates that older blokes have more endurance when it comes to making the fun last longer. The whole of our extended Easter break (Jim & I stayed on until Wednesday arvo) was blessed with wonderful weather – light breezy, warm sunny days reaching 24°C with crystal clear and cool evening’s ideal for staring into campfire flames and allowing for appreciation of comfortable warm woollen bedding. In those light breezes one could observe the silvery webs of tiny spiders ballooning on gossamer threads gliding and bucking as might a Chinese kite on a broken string; some attaching to tent poles and even to the crown of Bob’s tipi poles. The sun’s rays shimmered on the morning dew on these threads like many gleaming jewels of any regal tiara or crown, while a waft of smoke told of stirrings within the tipi. Pure magic! By Monday evening we were down to the foursome of Bob, Lyne, Jim and I at the after dinner fires. We decided to make some music and had a pleasant sing-along. Lyne particularly enjoyed this and said later that this was the very best evening for her. Oh, but she quickly added that Bob’s kept promise to do all the cooking chores was her greatest incentive to come camping. Ladies love camping – now there’s a title for Waylon Jennings. The following day we spent some efforts on a general tidy up of the area, burning much bark rubbish and stacking firewood. At evening it was just Jim and I cooking an early dinner. No sooner had we finished our meal when our hosts Bernie and Judy arrived at our camp. They’d brought a picnic hamper of barbecue meats and a bottle of red Ned to share. We had a good chin wag about anything and everything and of our camp development achievements of which we are all pleased and proud. For Sale – Lee bullet moulds .440 round ball; .445 round ball; .575 Minie ball; Lyman model 310 reloading tool for 44 WCF/44-40 plus small quantity black powder loaded 44-40 ammo; Brass mould with handles .45 Colt 271 grains; Lyman Ideal .38 Spl mould; 2 x 32/20 Win moulds; Lyman Ideal .38 Spl one shell resizer. Contact Murray for super special pricing deals. Ph 03 5346 1086. Many of us can still remember it – no doubt with a fondness for the fun and free life it represented. Remember when, to celebrate the day, kids at all schools were given a lapel pin featuring the flags of both the U.K. and Australia, signifying the bonds and origins of Australian settlement and of our constitutional sovereignty. Back then schoolboys and girls could freely purchase fireworks in any town across the nation. The fun was second only to the November Guy Fawkes bon fires, crackers and rockets. Over recent years May 26th has slipped by uneventfully but some still lament the passing of an era – that time before laws discouraging fun became the norm. Ms Tattler made particular note of the prevalence of elastic-sided rubber soled boots appearing whenever the grass is long and wet. Obviously some extra study and attention to proofing moccasins is needed, but perhaps a change of persona allowing more weather resistant authentic period footwear is your answer? (From Wikipedia, the free encyclopedia) Ballooning is a term used for the mechanical kiting that many small species of spiders, (usually weighing no more than 1milligram) use to disperse through the air. Many small spiders use gossamer or especially fine silk to lift themselves off a surface or use the silk as an anchor in mid air. The very fine silk used for ballooning has been called “gossamer” since 1325. Congrats on a marvellous newsletter Your newsletters are the best out of all . As Michael said,”it would be great to spend some time with you mob in the deep south”.